Our skin is our largest organ and aids in detoxing our bodies. The pores in our skin benefit from “exercise” to better rid toxins from the body. Cardio-vascular exercise, sunshine, dry saunas, and keeping toxic chemicals off our skin all help this process. Dry-brushing may also help our skin detoxify and keep us looking our best. While there don’t seem to be any scientifically-based studies on this, natural medicine providers often recommend this detox method. Removes dry, dead skin and clears pores, allowing the skin to “breathe”. Stimulates the hormones and oil-producing glands in the skin. Assists the body in the removal of toxins. How do you Dry Brush? Once a day, preferably before bed or before a shower or time in a dry sauna. Brush, starting at the feet, and work up towards the heart using light, short strokes (always brushing towards the heart). Then work from the arms towards your chest. Don’t forget your palms and soles. The skin should be stimulated, not red or irritated. 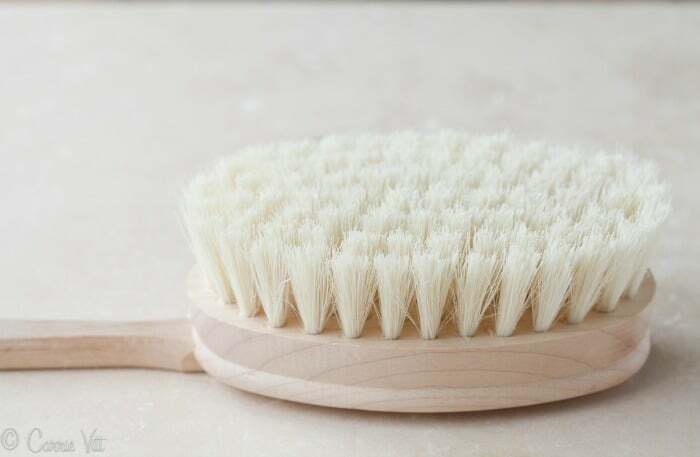 Dry brushing the entire body should take from 45 seconds to 2 minutes. It’s best not moisturize afterwards so the pores can breathe and rid themselves of toxins. Where do you get a dry brush? Most drug stores carry them. I prefer one with a long handle so I can easily reach my back. A favorite brush can be found on Amazon.